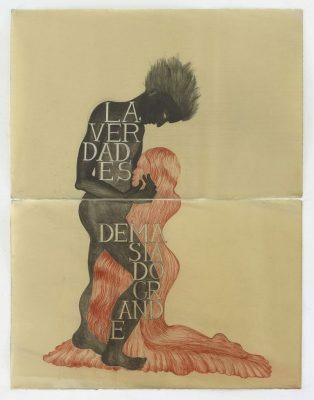 In this respect, the artistic oeuvres of Sandra Vásquez de la Horra, Ugo Giletta and Marine Joatton seem particularly authentic and noteworthy, with their extremely radical concentration on the liberation of fantasy and on the contextualisation of pictorial narratives in a rich, expanding frame of reference. The excessive, provocative intensity of the sensual physical entity of these visual creations functions as a subversive, liberating, anarchic and creative force that destroys the apparent, seductive attractiveness of the empty, meaningless, superficial, manipulated simulacrum world; it makes its banal spectacularism implausible and intensifies the dynamic cultural, historical and anthropological interconnections of the artistic narrative. 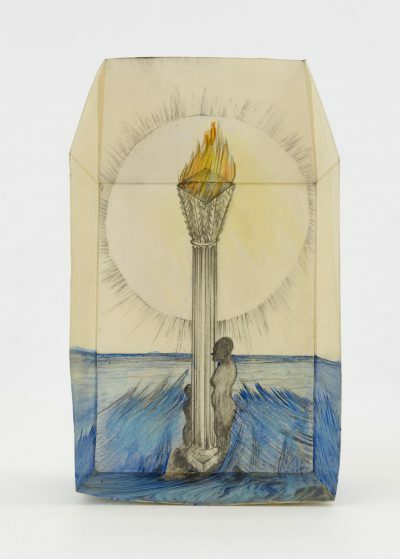 This complex, dense, cultural contextualisation of figures envisioned by a liberated imagination embodies the latent connections between specific, current, personal experiences and psychological, mythological, metaphoric narratives that convey certain archetypal attitude models, hierarchies, collective organisations and value systems. In the various works of Ugo Giletta, Marine Joatton and Sandra Vásquez de la Horra, these generally archetypal, basic, magical narratives are concretised in the context of real, current, personal, immediate experiences, in psychological and anthropological moments and emotional narratives; they are personified in the context of certain deep, fundamental cultural, ideological and mythological value systems inherent in contemporary life realities. These naturally include the various conceptions of life and death, such as life after death, body and soul, good and evil, fate and accident: the forces and energies, determinations and constellations that affect each individual life. It is above all the underlying relationship to death and to the various perceptions of the forces that are related to death and that appear to determine the end of life that generate the magical, mythic narratives which – often latently, and considerably transformed – determine basic, deep-seated belief systems. 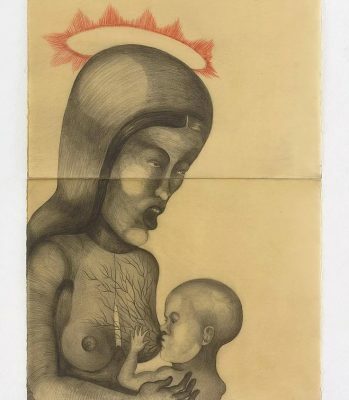 Sandra Vásquez de la Horra’s drawings are alarming and frightening, barbaric and exotic, obtrusive and seductively corporeal, enigmatic, hallucinative and ghostly. They appear alien and at the same time very familiar, like a remembered experience, as intimate as if they somehow originated from our own world, our own life. 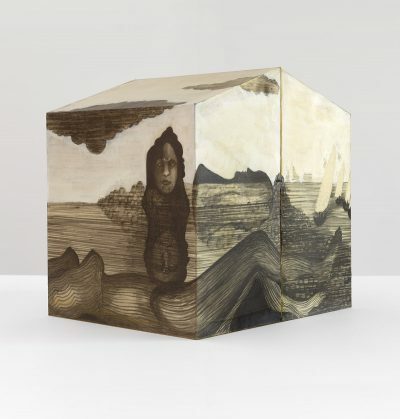 This irritating, enigmatic, mysterious ambivalence seems to be one of the most importance, albeit hidden characteristics of the poetic ambience of Sandra Vásquez de la Horra’s works. 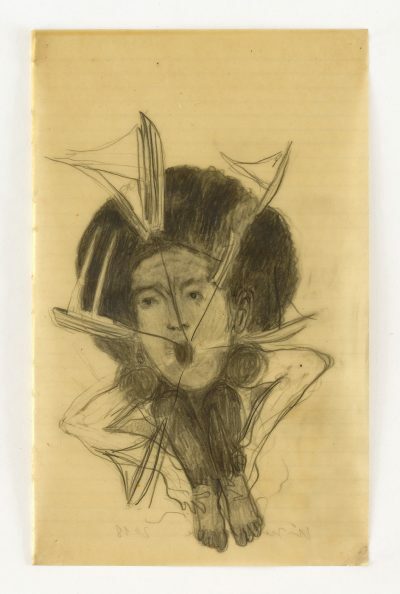 This ambivalence accompanies the entire diversified, complex process of perception, which operates with extended chains of connotation; at the same time, it imbues her works with a sustained imaginative intensity. The matter-of-course presence of these irrational, fantastic, magical and surreal moments within a graspable, sensual, material, physical reality, where violence, sexuality, emotionality, irony and malice, tangible immediacy and radical fantasy are closely incorporated into the anecdotic narrative, brings the drawn world of Sandra Vásquez de la Horra into proximity with the magical, surreal narratives of folk culture, of fairy tales and folksongs, legends and poems, in which the boundaries between empiric experiences and fantastic, dreamlike, irrational improbabilities dissolve completely. Often the artist creates figures like those found in the colourful, picturesque and at the same time obscure, mysterious, irrational mental and spiritual context of conventional collective beliefs and folk culture, which in most cases reify fear-inspired visions or prevalent images of death, disease or malevolent ghosts. 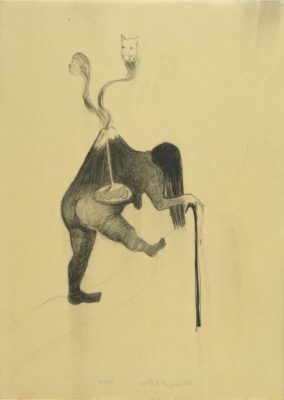 The tragicomic female figure “Volcanica”, drawn in 2009, is a very good example of this contextuality, which pervades the entire complexity of the subject matter of Sandra Vásquez de la Horra’s art. In this drawing we see an old, hunchbacked, short-legged woman, leaning on a cane, in a grotesque, uncertain and at the same time almost dance-like position, her right leg raised, her head bent low, almost like a figure by Breughel. Her hunch is drawn to look like a volcano, with a crater in the middle, out of which – like an irrational vision – volcanic smoke curls upwards in a divided column to magically take the form of two ghostly animal heads. The transformation of the female figure into a volcano and that of the volcanic smoke into animal heads look totally natural, although the entire irrational event, the entire visual appearance of the figure, the entire physical presence and evocativeness of the scene convey an enchanted, surreal, hallucinative, paralogical narrative. Like a fairytale – picturesque, colourful and improbable – it communicates an intense physicality and sensual reality, yet at the same time its realistic – and grotesque, almost caricature-like, ironic and somewhat derisive, sinister – physicality is combined with a fantastic irrationality. Something popularly archaic, something conventional, something collectively unconscious appears to be at work here. 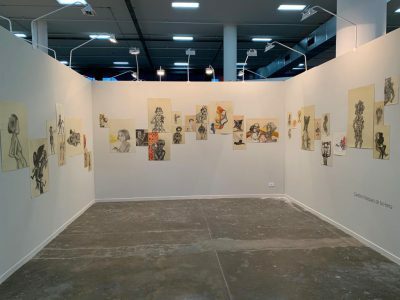 Sandra Vásquez de la Horra not only relates her own personal, particular, private visions and dreams, she also operates within the dense fabric of folkloric, magical, hidden, collective ideas, that is, in an archetypal, conventional and popular context of age-old metaphoric tales. 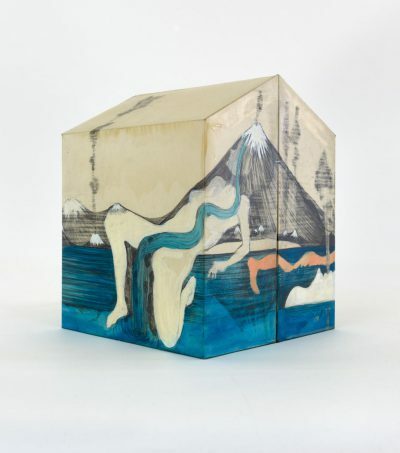 She radicalises these insofar as she more strongly emphasises certain contemporary orientations and sensibilities, certain current concretisations, and places them in the centre of the narrative. Thus, she works with these archetypal, magical, irrational motifs in new contexts that convey the imaginings and suppositions, anxieties and fears of our age. She intensifies the psychological orientation of the narrative and presents the sexual, pathological, autodestructive implications more openly and directly. At the same time, an ironic, even sceptical, critical and subversive questioning of certain old, traditional beliefs and magical, religious ideas plays an important role in the narrative. 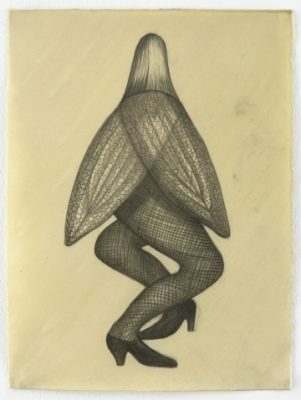 For this reason, Sandra Vásquez de la Horra’s drawings are not to be seen as mere archaisation, even though she operates deliberately and consistently with popular archaic configurations of collective, magical, ritual, paralogical material of the unconscious from conventional, traditional cultures. She seeks ways of liberating this material and utilising its subversive potential, and, by focussing radically on the connotations of a hidden, but obviously violent, pathological, destructive world of obscure, irrational, unpredictable improbabilities, makes us aware of dangerous psychological realities. In this sense, her poetic strategy is a courageous, forceful, poetically complex exploration of the questions of competence in artistic work and the search for an effective, authentic, up-to-date narrative that attempts to convey contemporary sensibilities and orientations through the subversive reconquest and reuse of old, popular magical and irrational ideas. 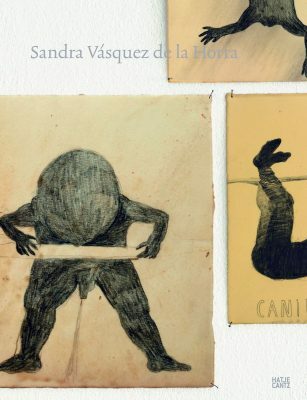 Sandra Vásquez de la Horra’s powerful, dark, sensual visions of an eternal black magic practiced by unknown and unpredictable figures that control the world pour forth in an unremitting flow of images. The motions, gestures, manipulations and obscure rituals of these figures create an atmosphere of anxiety and terror; yet behind it all, a quiet, ironic voice still manages to point out that everything may possibly be just an allegorical presentation, a subversive imitation, that perhaps it is all just a form of mystic, magical theatre, even if this piece of theatre comes horrifying close to the realities of inexplicable, boundless inhumanity, irrationality and manic self-destruction. Marine Joatton, Ugo Giletta and Sandra Vásquez de la Horra have the courage and the ability to draw attention to irrational, obscure, archaic, traditional, unconscious visions, while at the same time using subversity, irony, critical complexity and sensitivity to depict the eternal, endlessly repeating, anthropologically determined, archetypal human drama with authentic, truly contemporary empathy. Their narratives suggest a subversive and at the same time dramatic way of reading our reality. 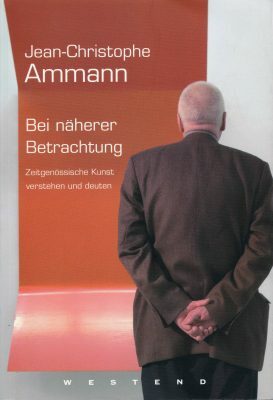 3 Ibid., p.137 (translated into English from the German source text) ausreichend sein.